Are you looking for a quick and effective at-home workout? 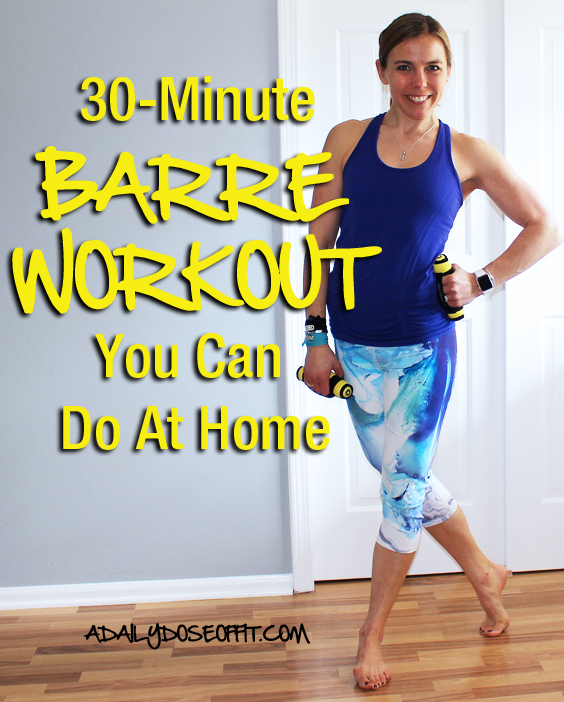 If so, I have one for you: It's a 30-minute barre workout you can do at home, or anywhere, with or without equipment. 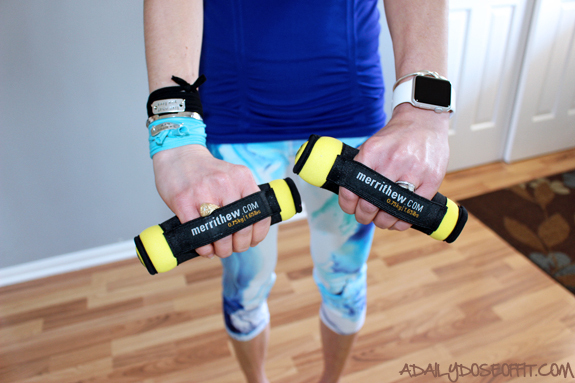 Barre workouts move quick and target your major and minor muscle groups simultaneously. I teach barre classes twice a week, and like to incorporate non-traditional barre moves, too. Pulsing, pointing and tucking...sure, this workout does that, too. If you're new to barre workouts, or are coming off a medical issue, please consult with your physician before trying this workout. I am an ACE-certified group fitness instructor and personal trainer, but haven't talked to you individually. While this workout is fine for most, it might not work for you. Listen to your body. Whatever works, right? If you don't have weights, your challenge changes: It's less about moving around weights, and more about harnessing the power of your muscles to contract in a way that leaves them challenged. As noted, you'll need to warm up and cool down appropriately. As for the guts of the workout, you'll do (15) repetitions per exercise, completing the entire circuit (2-3X) through. Maybe more if you want a longer workout. Be sure to put your weight into your standing leg, pushing the hips out behind you a little to protect the knee. Be sure to contract your abs as you pull your knee up. If downward facing dog isn't part of your fitness, flip yourself onto your back and connect hands and ankles above your belly. Note: In either situation, touching your ankle isn't a requirement. Using your abdominals to move through the exercise is most important! Note the position of the palms: Facing up toward the ceiling! This increases the intensity of the exercise, and can be modified by rotating the palms toward the ground instead. Try to keep your elbows as close to straight as possible. As you rotate your hip inward, really pull with your inner thigh muscles. If, however, you've had any type of hip surgery, you will need to consult with your physician before trying this exercises. Rotational restrictions may exist for you. It may look like a modified plank, but it's not! Lightly tap your knees to floor, using every ounce of your legs (quads, glutes, hams) to return back to your plank positing. Also, fight to keep your hips in line with the rest of your body! Any questions? Reach out: tara (at) adailydoseoffit (dot) com. Question: Do you exercise at home or at a gym/fitness studio? 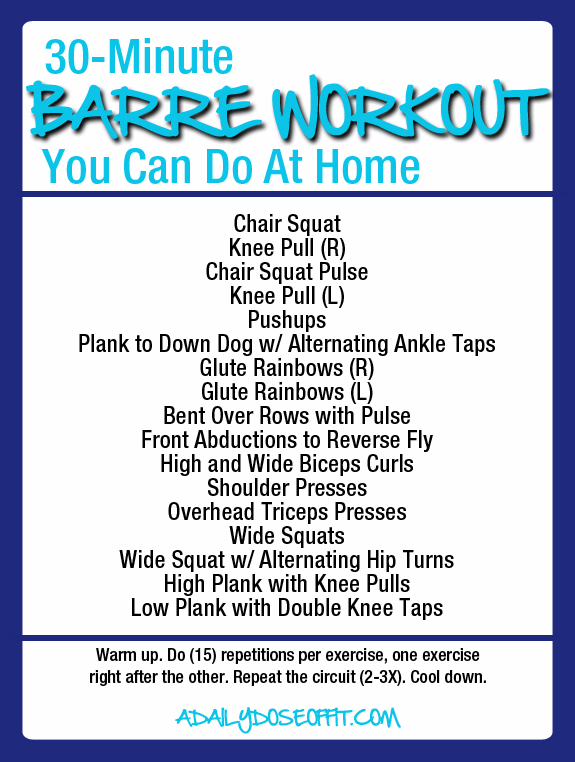 What is your go-to at-home workout? 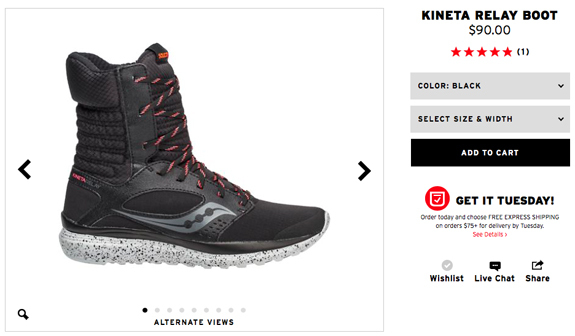 Running shoes that look like boots? 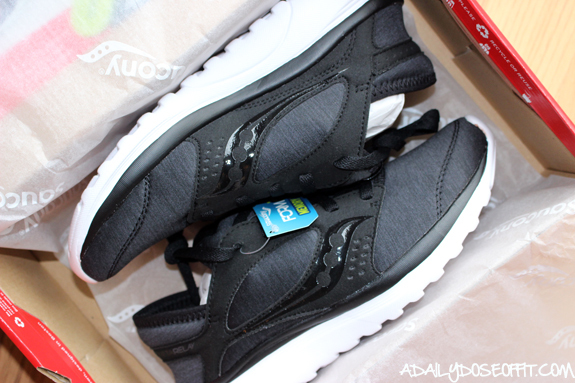 Yes, I want them (because I love @Saucony shoes). I am obsessed with my Saucony Kinvara 7 running shoes. I've clocked miles in a variety of different brands and styles, but these...oh, these Kinvaras are my jam. Never in my life have I purchased a second pair of the exact same running shoes. Theory? 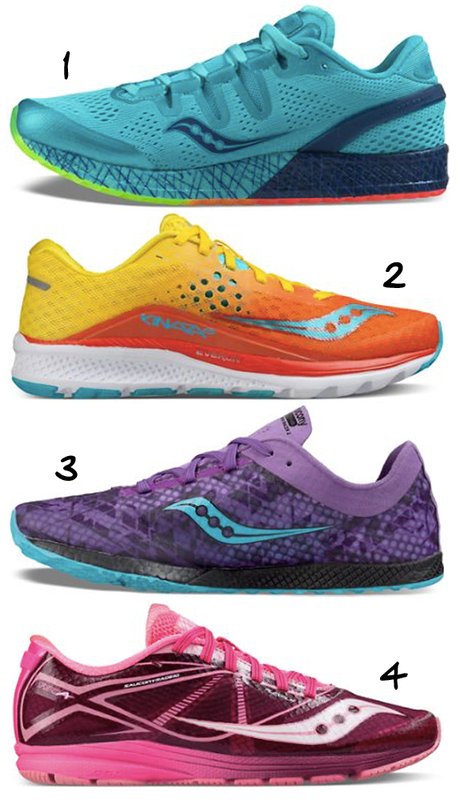 There are so many running shoes out there and I want to try them all! Except I like the Kinvaras, and I needed new shoes. Also, this particular pair matches the color scheme of Daily Dose, so yeah. Needless to say, I like Saucony shoes. I had a pair of Triumph 10 running shoes once. Now, I'm bouncing around in a pair of Saucony Kineta Relay shoes. Technically speaking, they are a neutral running shoe. But realistically, I think they're more of a training shoe. Or a "these are cute and fashionable and go with my athleisure look" shoe. I bought them to wear when I'm working. (Translation: Training clients and teaching classes.) My running buddy is also a huge Saucony fan, and this is what he wears when he's working. (Translation: Training clients and teaching classes.) So I trusted his opinion and bought them because I also thought they were pretty cute. Guys, they're ridiculously comfortable. 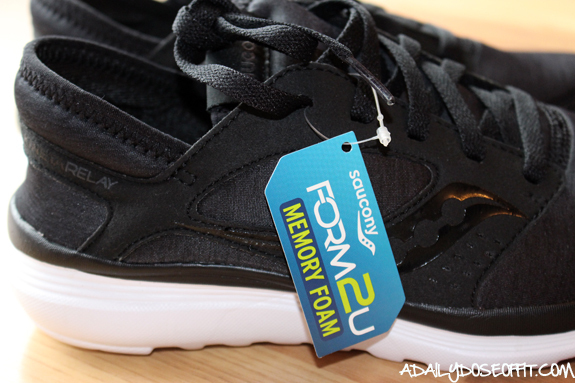 Super light weight, breathable mesh upper, and a memory foam insole that gives your foot everything it needs. My only complaint? Not a lot of lateral support, and my running buddy agrees. My foot slides a little from left to right, which is something I notice mostly when I'm doing shuffles or lateral lunges, etc. I think this is a testament to the breathable upper, which is very sock-like. 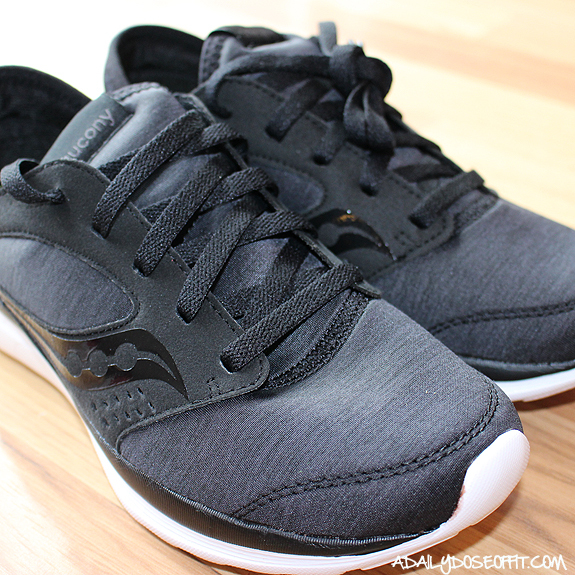 If you're looking for an everyday runaround workout shoe that's also cute, I'd still recommend the Saucony Kineta Relay. There are a wide variety of colors and styles out there, too. These shoes literally come in a boot version, too. I go to and from the gym all the time, and in the Winter, it's kind of a pain to shift from boots to gym shoes. I like that these function as both, so if I'm running late and need to meet a client, I can technically wear these on the gym floor. Full disclosure, I have yet to try them on, but I recently ran a race and saw a spectator wearing them. She loved them, and recommended them. So they're on my list. Now, I just need to find a way to justify purchasing all of them because I still have two racks full of gym shoes in the basement. (Translation: Because I can't bring myself to throw away the cute ones, even though they're blown out.) I mean, they're still sorta comfortable! Nikes and Mizunos and New Balances and Reeboks, oh my! Friendly reminder...I'm a girl. We like shoes. Question: What's your shoe brand of choice? Do you have a hard time getting rid of gym shoes? Does stress affect your workout? Stress is a common part of everyday life. I am stressed, you are stressed…we are all some form of stressed on a daily, weekly or monthly basis. I could sit here today and tell you all the magical ways to combat it. How you need to take a deep breath and get organized. How you need to meditate, keep a journal or find more time for the things you love. Or, I could just tell you to let it all go. But you’ve read those articles already. 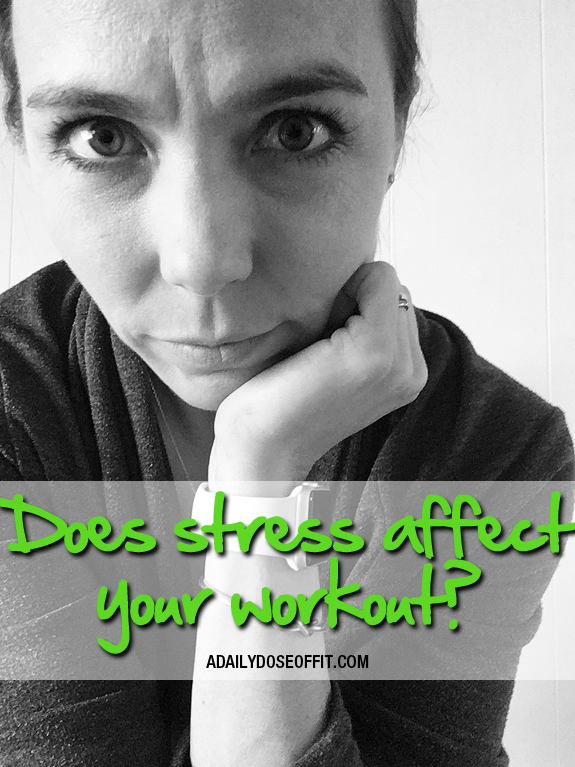 So let’s just talk about what stress does to your workouts. But it’s not just a mental thing. Extended states of stress put immense pressure on your body. It can add to many health issues, like high blood pressure, heart disease, obesity and even diabetes. That’s big picture, though. Small picture: It consumes you, and it affects everything you do from one minute to the next. This is especially true when you are a stressed-out exerciser. 1) Stress keeps you from working out. When you are “so busy” or “so behind” at work, you feel obligated to focus on work. What suffers the most? That 5:30PM fitness class you like to attend is scrapped for more time at the office. Early AM sessions with a personal trainer are pushed off for quality time at your desk before the boss gets in. 2) Stress prevents you from focusing on your workout. When your to-do list gets to be a mile long, or when your schedule is void of wiggle room—your workout becomes another item on your list. Another thing you have to get through so you can do what comes next. Which, of course, affects the quality of your workout. 3) Stress takes away recovery time. According to the Journal of Strength and Conditioning Research, stress uses up everything you’ve got. It puts an immense amount of pressure on your body, zapping it of the resources it needs to function properly. And it needs a lot of resources to recover from a solid workout. 4) Stress can make you gain weight. Many studies have been done on the effects of stress on weight gain, and they all show that it does bring on the pounds. So if losing weight is your primary motivator for working out, you’ll have to be really good at leaving stress in the car when you pull up to the gym—we all know how easy that is (but I assure you, it can be done). I know that sounds counterintuitive to the above, but you should use all of that stress to fire up your workout. So make time for the gym when you are stressed, and be mindful of all the ways that stress can negatively affect you. Your body, mind and soul (and ultimately your workout) will thank you for it. Question: How do you handle stress? Does it ever affect your workout? Do you find that working out helps you de-stress? If you haven't tried this quick and healthy breakfast or snack option from Starbucks yet, you probably should...if you can get your hands on it. Word on the street is that Starbucks' supply is not meeting the demand for these little treats. My local store hasn't had any for a few days now. So I did what any girl would do. Here's the thing, actual sous vide cooking can take a bit of time. You have to heat water to a desirable temperature, keep it there, then submerge your food (which is in a plastic bag) for the time it takes to cook it. There are special sous vide machines, or you can use a cooking thermometer in conjunction with your favorite pot. In theory, it's a relatively easy and effective way to cook food. But easy and effective do not always mean practical. And for me, it's not practical to cook this way. So decided to take the flavor and ingredients in Starbucks' egg white and red pepper egg bites and make them my way. You know, like egg cups. 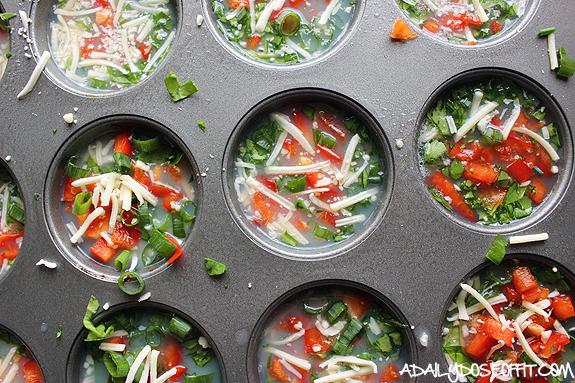 Because it doesn't get much easier than making egg cups in the oven. 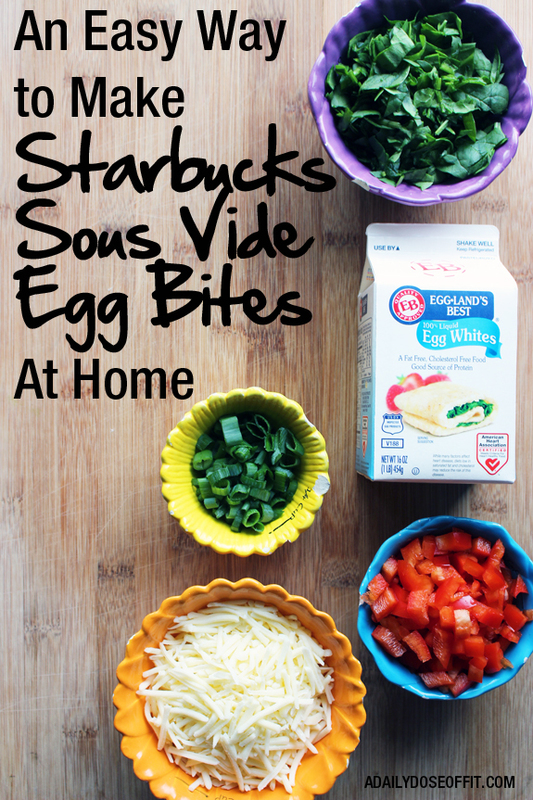 Starbucks sous vide egg white and red pepper egg bites have spinach, green onions and Monterey Jack cheese in them. Plus, obviously, red peppers and egg whites. I got about nine egg cups from one carton of egg whites, so I opened a second carton to finish off the pan. (Fill each cup halfway.) And then I put a pinch of each of the other ingredients in every cup. There's no need to measure. Bake the pan at 350F for about 20 minutes. Pop out the cups when they're done and let them cool. 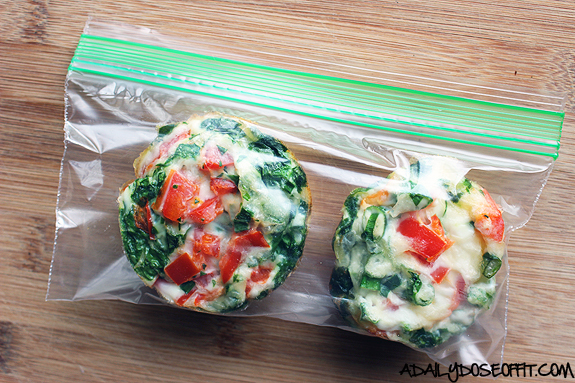 You can store them in an airtight container in the 'fridge, or you can divide them up in snack bags for easy grab-and-go breakfasts and snacks. 1) Preheat the oven to 350F. Spray your cupcake pan with non-stick cooking spray (even if it's a non-stick pan...trust me). 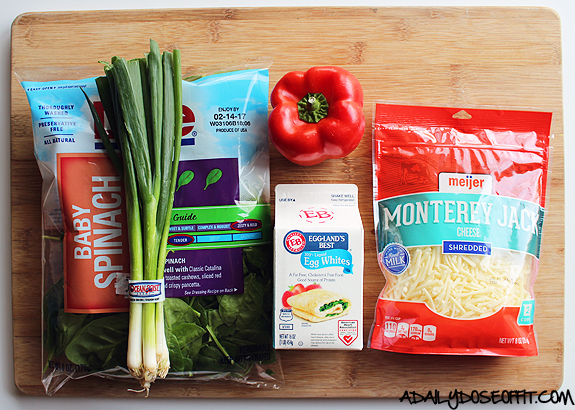 2) Shred the cheese, chop the rest of the ingredients. 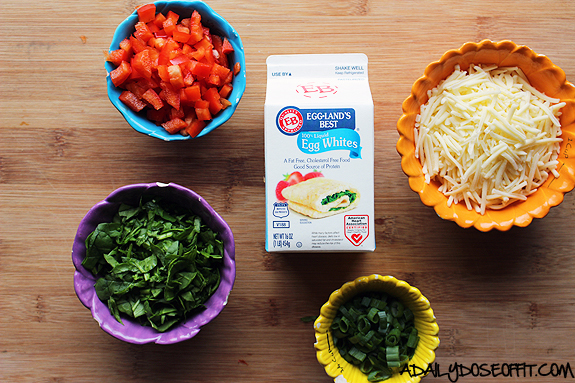 3) Fill each cup halfway with egg whites. Distribute the rest of the ingredients evenly among each of the cups. 4) Place in the oven and cook for 15 to 20 minutes. 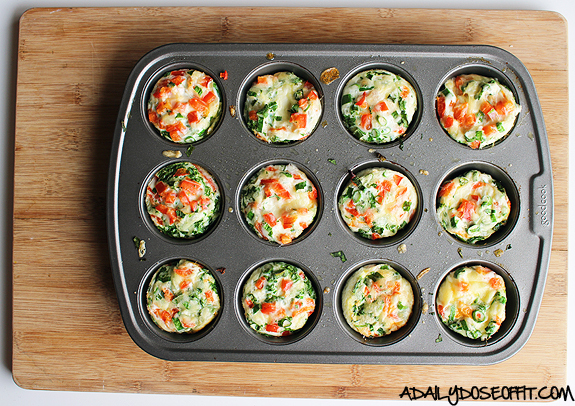 Remove from the oven when done, and shake the egg cups out of the pan to cool. 5) Store in an airtight container in the 'fridge, or divide among snack bags. You can also totally adapt this. If you haven't discovered egg cups yet, now is the time. You'll find a million different recipes on Pinterest, and I bet you can even come up with one on your own. They're so simple to make. But if you're crunched for time, I highly suggest you visit Starbucks and try the sous vide egg bites. And a coffee because #coffee. 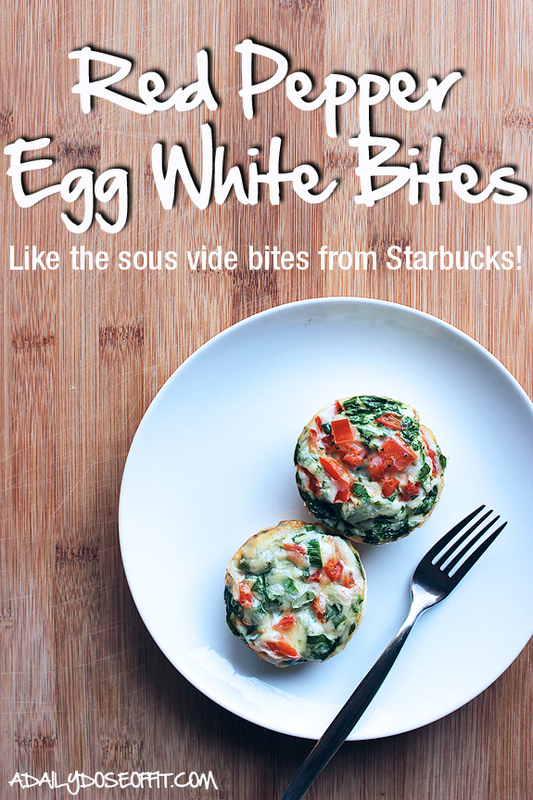 Question: Have you tried the egg bites from Starbucks yet? Do you like them? Have you ever used the sous vide cooking method? Did it work?